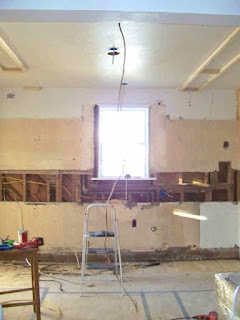 Once everything was cleared out of the kitchen and all the debris was cleaned up, the upper cabinets were ready to go in. I love this pic of Nate. The reason he's so happy is because this is the first time he got to use his Kreg jig (you can kinda see the pocket holes) to hide screws. This is the spacer for one side of the upper cabinets. We neglected to order upper spacers so Nate used some wood we had on hand to make the spacers and we'll paint them later. 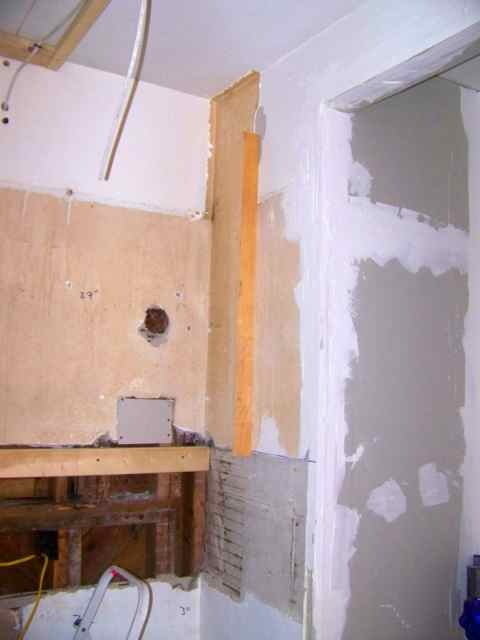 We measured out where the cabinets should hit on the wall and then attached the spacer to the wall (notice it looks like the wood is just floating there? ahh the magic of Kreg) so that it would line up correctly to the cabinet. 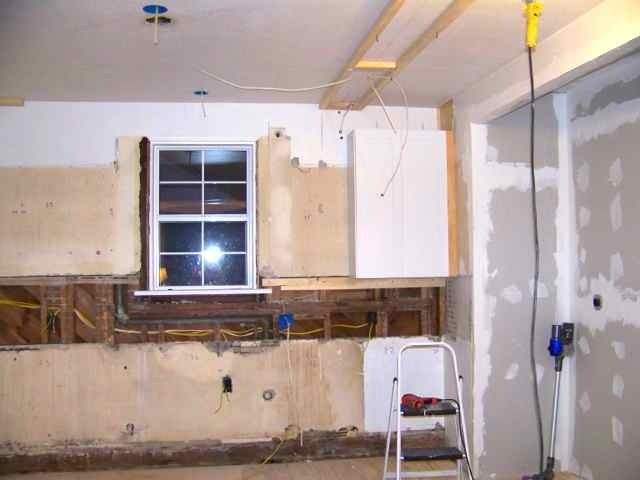 One other thing that we did before putting up the cabinets was to attach a 2x4 to the wall so that the upper cabinets could rest upon it and automatically be at the correct height. 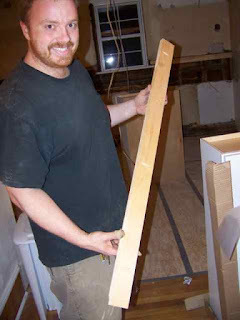 By leveling the 2x4 when attaching it, we also guaranteed that the cabinets would be level. This is a trick we learned when we did our last kitchen renovation and it is such a simple way to save so much time and energy. 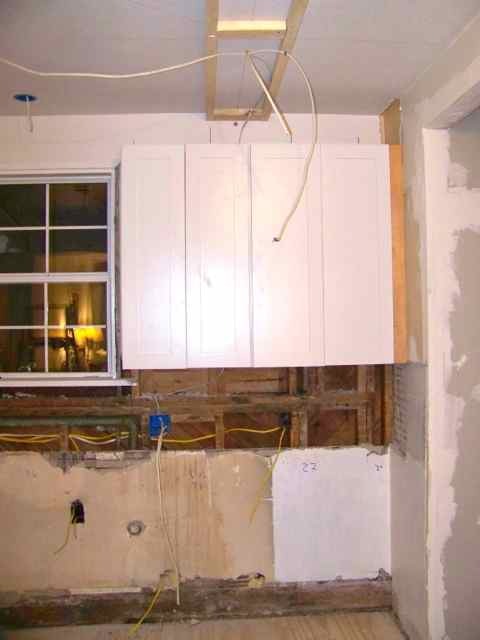 Without the 2x4, you need so many people to put up upper cabinets since you need people to hold the cabinets and more people to make sure they are level/at the correct height and at least one person to screw the cabinet in place. By using the 2x4, putting in upper cabinets becomes a 1.5 person job. Nate was able to carry the cabinets up our step stool and rest the back on the 2x4. I would check to make sure that the base was sitting flush on the 2x4 and then he would put one screw in at the top (while putting pressure on the top so it would fall forward) and then, while I kept a hand on the cabinet just to make sure it couldn't move, Nate would climb back down and put the bottom screws in at which point I didn't need to hold it anymore. A few more screws later, the cabinet was completely secure. This process went fairly quickly and once one side of uppers was finished, we took down the 2x4 and moved it to the other side and repeated the process. Using the 2x4 allowed us to install all of our upper cabinets in about an hour and a half. 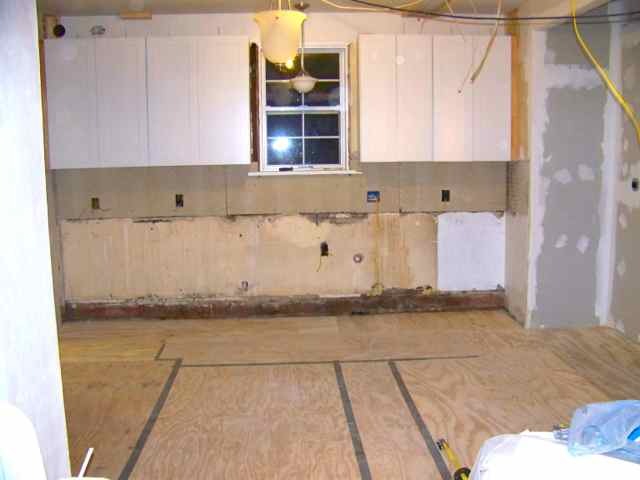 This last picture was actually taken the next day so you'll notice we also installed the cement board for the backsplash and the combination of that and the cabinets make such a big difference in terms of starting to feel finished. Since those things are now done, the floor is next on the list since nothing else can get installed without that. Honestly, the floor is the one thing I have been not so patiently waiting to install. We've have been living with plywood or chipped tile floors for months and I am sooo excited to finally have an awesome new kitchen floor. What a HUGE project! You're making progress, though! It will look great once you've put all that time and effort into it!